59 x 42 mm. – 216 leaves, with 12 Calendar miniatures, 22 full-page miniatures, and, 23 full-page borders of Ghent-Bruges type. 59 x 42 mm. 216 leaves. 12 Calendar miniatures, 22 full-page miniatures, 23 full-page borders of Ghent/Bruges type. An exceptionally painted, jewel-like prayer book, painted by one of Europe's most celebrated illuminators, Simon Bening. One of the most celebrated painters of Flanders in the 1500s, Simon Bening was hailed as the best master of illumination in all of Europe. By the 1530s – the likely date of the present Hours – he was patronised by princes in Spain, Portugal, and Germany, as well as in his homeland. Later in the century, Bening’s achievements were celebrated by such luminaries as Vasari. Small, personal prayerbooks, either Hours or Rosaria, seem to have been a speciality of Bening. Few of these books are as extensively autograph as the present manuscript and none, as far as we have been able to ascertain, is as small. It seems likely that it was intended to be worn, serving both as devotional aid and as jewellery; it could have been hung around the neck or, more probably, from the girdle of its owner. 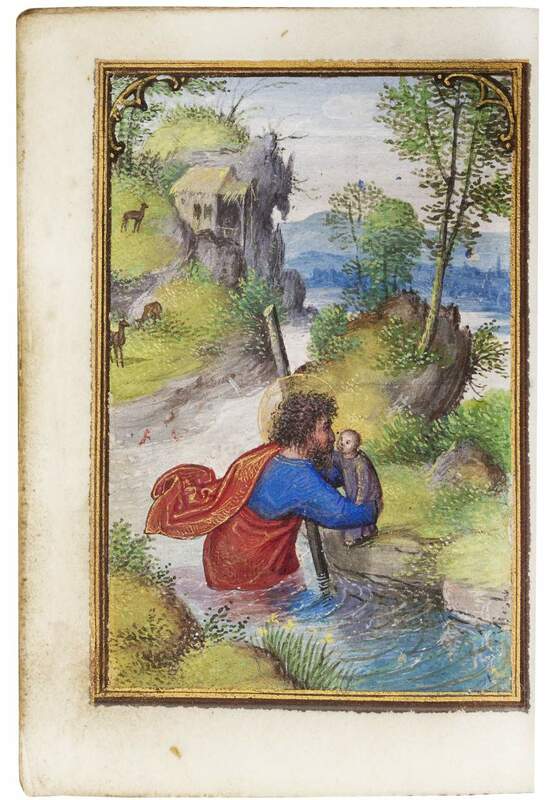 In spite of their size, the miniatures of this Book of Hours are of the highest quality: incredibly detailed, affecting, atmospheric, and painted in Bening’s most polished technique. Many of the compositions are inventive in both iconography and composition. There are no concessions to scale: it is a virtuoso performance. This work is now in the collection of The Metropolitan Museum of Art in New York. Met curator Barbara Boehm is featured in an engaging video from the MetCollects series, in which she describes this wonderfully tiny book of hours.